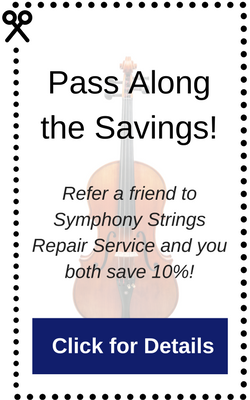 Regular instrument maintenance is most important with a string instrument. Since it is constructed of wood, it is susceptible to atmospheric issues more than other instruments. Please follow these suggestions for keeping your instrument in the best condition. Wipe strings and fingerboard and chinrest with a soft cloth to remove excess rosin and hand oils. Wipe off the top of your instrument to remove rosin dust. Reduce bow tension several turns to allow hair to relax. It is always a good idea to have your instrument inspected by your repair tech at least twice per year as seasonal changes arrive. As the seasons change from low humidity winter to high humidity summer your instrument can experience swelling or shrinking of the wood. This change can cause shifting or loosening of certain components. Shifting of the bridge or soundpost position, loose pegs, and open (unglued) seams are typical issues to watch for. If your instrument suddenly sounds different than usual, that could be a clue that something has changed. Have your teacher or your repair tech check it over immediately to avoid permanent damage. If you experience stuck tuning pegs, fallen bridge, fallen soundpost, bow problems, etc. contact your repair technician for proper correction of these issues.